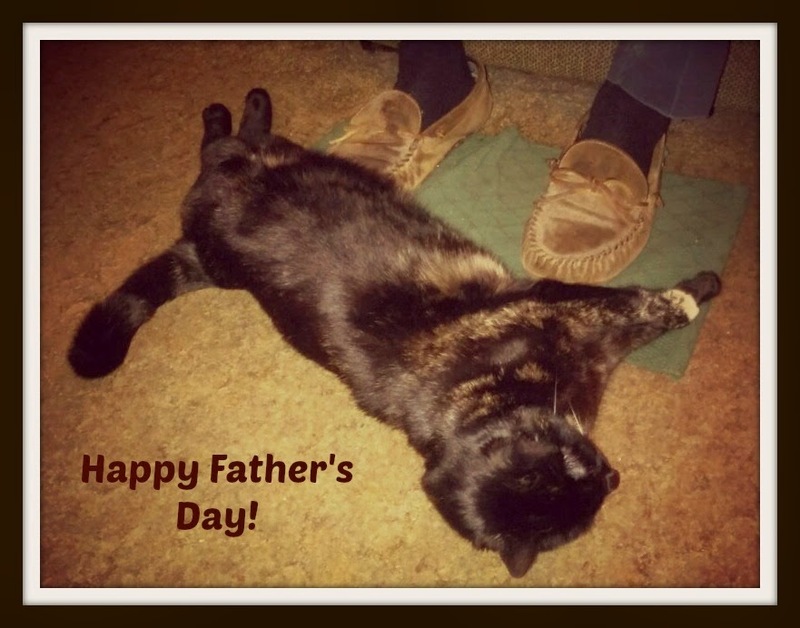 Melissa's Mochas, Mysteries and Meows: Caturday Art: Happy Father's Day! Hey everybody, Truffles at the keyboard! I don't have a Dad, but I do have a Grandpa. Some of you may remember that after Mommy adopted me I had a bit of trouble with my Grandpa after he accidentally stepped on me one night. For quite awhile after I would run away every time he came near me. It took some time (and lots of Calming treats!) but I finally decided to forgive him. All the proof you need is captured in the picture below as I calmly lay at his feet. Mommy even teared up a little when she snapped the photo! Since the Photohunt theme this week is "dusk", we used the Dusk effect in PicMonkey and finished the picture off with a Museum Matte frame. Happy Father's Day to all the wonderful cat guys out there! Check out other artsy kitties here. HURRAH!!! We're glad you got over being stepped on, sweetie...that's a big step for trusting! Love the photo! Happy Father's Day! Looks like you and Grandpa are good friends now...Happy Fathers Day! Glad you got over being stepped on ! such a sweet photo! Happy Father's Day! Truffles that is beautiful and tell your Grandpa Happy Father's day from us! Whoa! Forgot PicMonkey has a dusk effect. Good call. Happy Father’s Day to Gramps. Aaaaw Truffle dat's so wunnewful. Happy Father's day tu yoous gwampaw. Wees don't hav any men in ow lives at all. Just mommy. Sweet photo and love the dusk effect. Happy Father's Day to your Grandpa! Hurray for trusting your grandpa once again! That takes a lot of love and trust! Happy Father's Day! Such a sweet photo! Hope you had a great Father's Day!